This semester I am assisting Hans Tutschku with a class at Harvard University on improvisation with electronics. I asked several improvisers to choose pieces of music that are important to them and their practice. For the third edition of this series, Ute Wassermann has kindly agreed to share some of her favourite music. 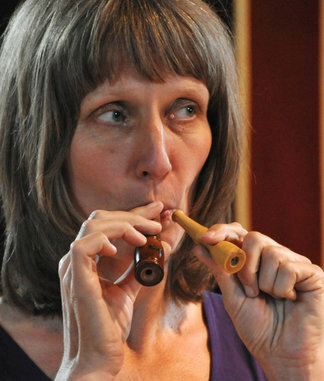 Wassermann has achieved recognition as a vocal artist, composer, and sound artist, with her personal, highly characterised, nonverbal sonic language. In addition to a richly developed range of vocal colours, she masks her voice with bird calls, resonant objects, and develops sound installations. She appears regularly as an improviser in London and Berlin, and has also premièred works by composers such as Ana Maria Rodriguez, Michael Maierhof, and Chaya Czernowin. Wassermann’s selections introduce diverse vocal worlds, intersections of voice and technology, and various improvisatory practices. Thanks so much to Ute for providing these insights into her listening world. Below is an example of her own live performances and you can find more on her Vimeo page.